The development of ethnic theater in the United States is closely connected with immigration as a social and cultural process. Ethnic theater has changed along with the immigrant generations. Despite acculturation and assimilation, ethnic theater is still of social, political, cultural, and educational importance within the American society. Although it constitutes an opposite to mainstream theater, there is also an interrelation between these two. 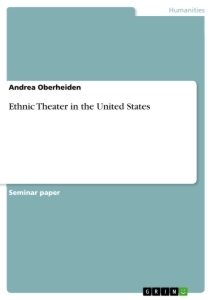 In this paper, I will summarize the historical development and evolution of ethnic theater in the United States and examine its impact on society and culture. 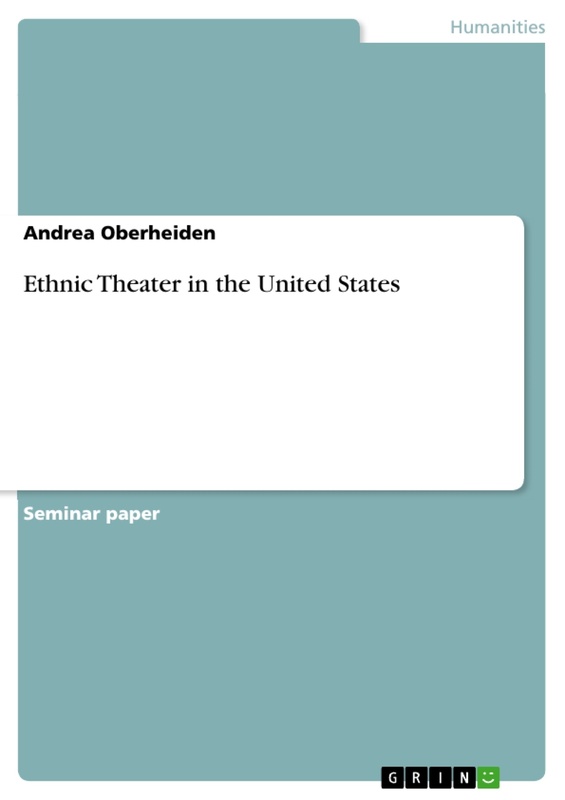 Ethnic theater comprises African American theater, Native American theater, Hispanic theater, Asian American theater, and European American theater, to mention only the main categories. They all divide into subgroups. For example, the European American theater divides into Armenian, Byelorussian, Danish, Norwegian, Finnish, German, Hungarian, Irish, Italian, Latvian, Lithuanian, Polish, Slovak, Swedish, Ukrainian, and Yiddish theater. Thus, ethnic theater comes from a huge variety of cultural backgrounds and traditions. African American theater emerged from black slaves who were brought to the United States from the eighteenth century onwards. Those slaves brought their singing and dancing traditions to their new country. There they formed a new theater tradition on the fundaments of their cultural heritage. Native American theater originates in religious rituals and communal celebrations. The number of European and Asian immigrants became noteable in the nineteenth century. They often brought their own theater traditions with them. German theaters opened in New Orleans and in New York City around 1840, Norwegian and Swedish theaters opened in Chicago in the 1860s, and Chinese theaters were established in San Francisco in the early 1870s. Ethnic theaters worked with semi-professional and professional actors and directors who had often received their training in the countries of their origin. The theaters were frequently sponsored by several local institutions such as cultural societies, churches, youth groups, athletic clubs, and universities. Nonetheless, ethnic theater always had to struggle in terms of finances and different kinds of conflicts. Sometimes the reasons lay within the ethnic communities themselves. Their members had different views on what lifestyle should be followed in the new country. Often enough immigrants had to choose between two extremes: to assimilate or to stay in the traditions of their backgrounds. But ethnic theaters also had to deal with opposition coming from the outside. With the white Anglo-Saxon Protestants forming the majority within the American society, ethnic theaters often encountered difficulties with local authorities for giving performances on Sunday. Those times were far from today's "political correctness". Different lifstyles and religious traditions led to fundamental conflicts and ghettoization. Ethnic theater experienced its peak in the early twentieth century due to a huge wave of immigration at the turn of the century. Ethnic theaters were the only theaters that provided inexpensive entertainment in the immigrants' native languages. The number of amateur groups increased immensely until the 1930s. Formal theater was sometimes a new experience for certain groups of immigrants, for Jews from Eastern Europe for example. By referring to an early twentieth-century journalist, Maxine Schwartz Seller says that for those immigrants, theater was of a much bigger importance than it had been in their homelands. Immigrants went to see theater performances in their rare spare time mainly to escape from their everyday lives. Immigrants had to work in mills, mines, and sweatshops under exploitative conditions, they lived in run-down buildings with frequent outbrake of fire. They had to live with poverty, ghettoization, and discrimination. There was either not the possibility or the willingness to become integrated in the American society. Therefore, ethnic theater became a necessary institution and it achieved political, social, cultural, and educational importance for ethnic groups. Many immigrants started to act in theaters themselves or functioned as writers or directors. Ethnic stages either performed tragedies in which the characters acted more cruelly as people did in the immigrants' real lives, or theyperformed comedies in which they made fun of the kings or czars ruling in their countries of origin or even of local (American) authorities. Those were plays in which immigrant audiences could feel like an anti-establishment.